"Everyone who is born holds dual citizenship, in the kingdom of the well and in the kingdom of the sick," wrote Susan Sontag in "Illness as Metaphor," her famous essay. "Although we all prefer to use only the good passport, sooner or later each of us is obliged, at least for a spell, to identify ourselves as citizens of that other place." 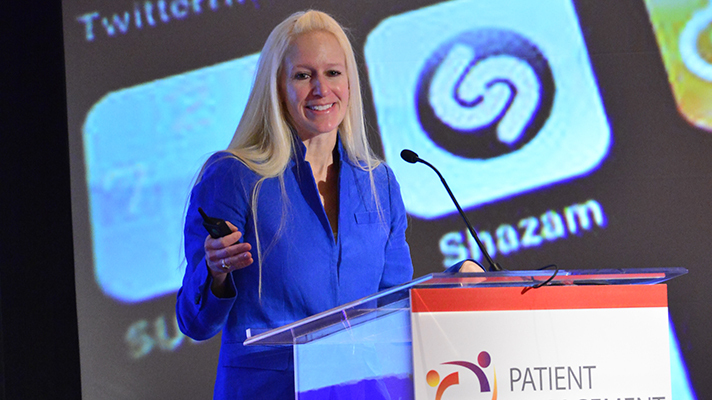 In her opening keynote at the HIMSS Patient Engagement & Experience Summit on Monday, Adrienne Boissy, chief experience officer at Cleveland Clinic Health System, cited Sontag and implored us in the industry to do a better job helping patients navigate between those two realms. "There are moments in a patient's journey that we should be empathizing with, and designing for," she said. Healthcare has gotten better in recent years at expanding access and making it easier for patients to at least get a brief check-in with a provider: walk-in clinics and express care, e-visits and telehealth consults. But patients are concerned about much more than just when they're going to book an appointment, said Boissy: "We need to dream bigger about what we can do with access." It isn't just about access to an appointment, after all. It's about patients' access to their own health data. It's about their relatives and loved ones' access to their care teams. It's about access to transparent facts about cost. It's about "putting information in the hands of patients that matters most to them," said Boissy. Thankfully, change is coming in terms of getting meaningful knowledge about cost and quality to patients, she said, and innovations are happening to improve patient experience. That's good, and long overdue. Because "the problem with failure of service in healthcare is that it results in suffering of patients," said Boissy. "That's what makes us different from any other industry." Healthcare owes it to those patients to offer them a better experience, she said. It's time for the industry to up its game. And companies that are much more adept at managing consumer expectations are already starting to force the issue. "The Amazons and Apples of the world have mastered service, and they are coming for us." But that doesn't just mean relying on technology to do the job, of course. Human connection and empathy are essential to better patient experience. "We must digitize moments that can be, and humanize moments that must be," said Boissy. Nor does it mean simply focusing on the patient (helping cure the affliction of "waiting room-itis," for instance). Caregivers are one half of the equation, and many of them are finding the healthcare experience to be suboptimal, or worse. "This country is facing a crisis in healthcare," said Boissy. "Frontline physicians and caregivers themselves are suffering." Burnout and emotional exhaustion are rampant. Dissatisfaction with electronic health records is a common complaint. It's important to help restore "fulfillment and meaning" to the work doctors and do every day, she said. "We have to design for what matters most – not just for our patients, but for our clinicians," said Boissy, and help create "not just a human experience, but humane."